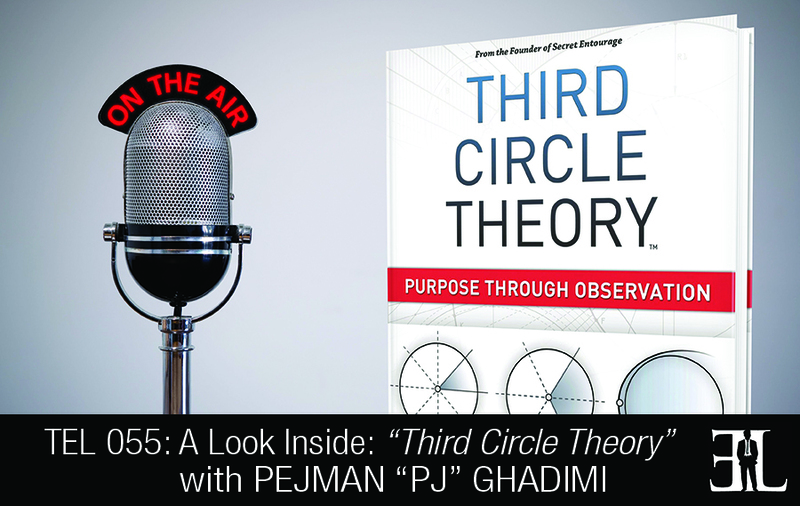 In this episode Pejman Ghadimi, also known as PJ, shares his book, Third Circle Theory where he reveals the birth of entrepreneurship. In his book, Ghadimi provides you with a reflection of yourself through the different stages you will go through in life in order to become an entrepreneur. After reading his book you will walk away understanding how much more of life you have control of than you actually think. This book is perfect for the wantrepreneur who is searching for a way into entrepreneurship by overcoming fear and ultimately taking control of life. First off most entrepreneur books out there are actually business books, they aren’t entrepreneur books. Very, very few books actually break down the difference between business and entrepreneurship. Business is about profit, and entrepreneurship is about value creation. They are completely two different faces in something that has been merged together by society in general. But also my book is not really an entrepreneur book; it’s more like entrepreneurial awareness and in general life awareness. It is about the birth of entrepreneurship but the book itself has no relevance in terms of business aspects and how to actually market your business. It’s rather a reflection of one person’s self through the different stages they go through in life in order to become entrepreneurs. I want everyone to read this book from the first line to the last line. If you don’t you won’t actually understand the core concept of the book. I want more people to walk away understanding how much more of life they have control of than they actually think. To overcome their fears is part of that equation but taking control of their life is the key part of this book. The book is written in a manner that creates self-reflection. I describe a lot of aspects that I’ve encountered in my life however this book is not about me, it’s about you. If you’re reading this book you will find yourself ultimately pausing a lot after each section and self-reflecting on if these things that I explain are applicable to you or not. I believe that everybody in life goes through three different circles and so I’ve broken up an individual’s life into three different segments that everyone, no matter who you are, will ultimately either go through some or all of these depending on how far you get in life. And by how far you get in life I am not referring to how much money you make. The first circle is the one we are all born into and it’s called the Circle of Circumstance – The mastery of circumstance. We are all born into an environment and that differs for everybody. Some of us are born poor, some born rich, some born in climates that allow business to occur and others to a third world country. Regardless of where we are born we are still born into this world into a circumstance and mastering circumstance is one of the key things we must do in order to be able to be effective in our lives. The day you take control of your life is when you understand that whatever your circumstance is it is not the reason why you are going to be successful or not successful. Things like fear, goals and habits are things we are all born with and adhere to based on the environment we are born into but we don’t have to. So this first circle teaches you how to master your circumstance, how to take control of your life regardless of how good or bad it is and regardless of what fears you face. The second circle is The Mastery of Society. A lot of people understand that regardless of where you are, you belong to a society and no matter how advanced or behind that society is you still have to learn to master it in order to gain a voice in it. Part of mastering a society involves making money and without learning how to make money it is very hard for a society to actually hear out what you have to say. Most people we see in our society have had success and typically that success is defined by how much money they have made and therefore they earn a voice within that realm. It is important in life that no matter how much of an outcast we want to be or how much of an individualized person we want to be, we have to master the element of the society we live in. We need to understand how to actually make money so that we are able to function and go past it. Most people get stuck in this circle because they’re not able to get past the fears and take control of their circumstance from the first circle. A few people are very successful in society and transition on into the third circle – The Mastery of Life. The mastery of life occurs in a very different state because it has no relevance to money. This is about the mastery of one self rather than the mastery of how you belong to society of people. One of the main things about entrepreneurship is it really takes place in this circle. A lot of people don’t divide the difference in being self-employed and entrepreneurship. If you are in business and self-employed you are still in the second circle and its one purpose is to make a profit. However, when you choose to take on entrepreneurship it is because you are out there to try to facilitate the way we do business. Your primary goal no longer becomes to make money; your primary goal becomes to create change. Once we’ve mastered how society works, we’ve understood how to take control of our circumstance we come up with an idea for us to improve the way things work. I am the founder of The Secret Entourage. My background was spending about six years as an Executive Vice President for Fortune 500 and from there I went on to start two seven figure businesses, one in consulting and the other in the luxury lifestyle arena. And later found that money was no longer the focus in my life and therefore founded Secret Entourage to help younger individuals who don’t have access to great leadership, mentorship or education find the real life knowledge for free. My mom was the inspiration that led me to becoming very self-aware and the books ideology is about helping others become very self-aware. The inspiration was ultimately seeing her life of sacrifice and really giving birth to all the learning that I have had the opportunity to learn throughout the years into this book.